British Columbians were given a glimpse at what regulated ride-hailing could look like in the province with the release of a report by an all-party committee. The panel – made up of MLAs from the NDP, Green and Liberal parties – released a list of 32 recommendations Thursday, a month after a three-day hearing from experts and the public. Among the recommendations are that drivers should be required to complete background checks and training, and that the province consider caps or bases on fares. The recommendations were formed following feedback on how ride-hailing programs should be regulated from companies including Uber and Lyft, as well as representatives of the taxi industry and other stakeholders. They heard 26 presentations during the hearings, and collected a dozen written submissions by mid-January. While digesting the information, the committee said five key areas of concern emerged: accessibility, employment, public transportation, traffic congestion, rural communities and the future of the taxi industry. The NDP initially promised it would bring ride-hailing into B.C. by the end of 2017, but a revised timeline has not yet been revealed. The government is still waiting on another report on the impact on the taxi industry, due later in the spring, so legislation is unlikely until the fall session. While it doesn't give any definitive answers, the all-party committee's report gives the public an idea of what policy-makers will be looking at in the coming months. The possible effects of ride-hailing on existing taxi industries have been the main source of criticism in most Canadian jurisdictions where Uber is already operating, as well as in B.C. During the hearing in January, Vancouver Taxi Association spokesperson Carolyn Bauer said that while most in the industry are aware that the public's needs are not being met, the government should be cautious with opening the market to ride-hailing. "The solution here is not to allow anyone with a car or an app to enter the taxi market. That will destroy the existing taxi industry," Bauer said at the time. Approximately 65 per cent of B.C. 's 3,200 taxis are located in Metro Vancouver. The industry employs about 8,000 people province-wide. She said she was aware that those looking for rides were forced to wait too long, and that hailing and payment models were not up to date, but instead pitched a made-in-B.C. app that would allow those in need of a ride to hail whatever type of driver-for-hire was nearby. The app would allow passengers to hail cabs from any company, but would effectively keep Uber out. 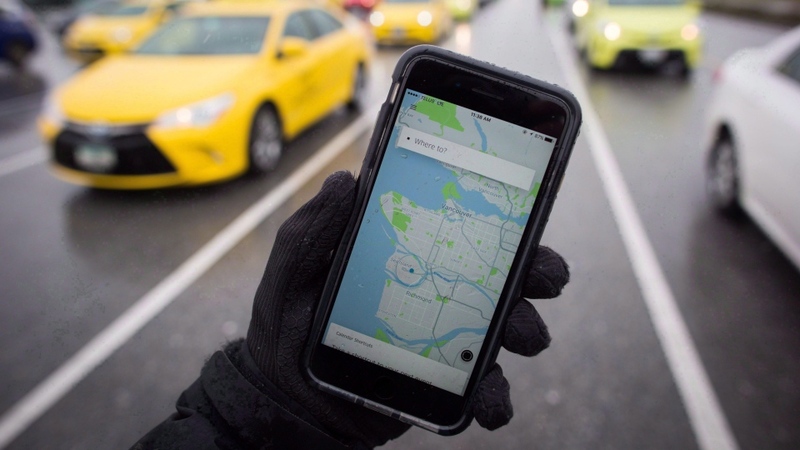 The idea that the market doesn't have room for both taxis and ride-hailing apps was challenged by both Weaver and Michael van Hemmen, Uber's public policy manager for Western Canada. Van Hemmen said taxis are still operating in every North American city where Uber exists, and that one taxi company in Toronto said it was having its best year yet. "We view our primary competition as a personal automobile. We want to find ways that you will choose not to drive yourself, but instead choose Uber and public transit, bike sharing and car sharing, and other sustainable alternatives," he said at the January meeting. The committee felt that the taxi industry will be impacted, and that the issue merits further consideration. Among its recommendations to help soften a potential blow, it suggested protecting specific types of business, such as airport and hotel taxi queues. It also suggested the government review existing legislations and make updates as needed "to allow for fair and equitable competition between the two industries." If taxi alternatives are permitted to operate without defined service boundaries, cabs should be allowed to pick up fares outside their home jurisdictions if they've recently dropped someone off and the new destination is back in their service area, the committee added. Among the recommendations in other areas, which can be read in full online, are that the government may want to act preemptively to prevent surge pricing. While Uber and Lyft trips sometimes cost consumers less, the companies charge higher rates as demand for rides increases – for example, during rush hour, bad weather or New Year's Eve. Standard fares can increase as much as 2.5 times when the service is in demand, so a $10 fare could cost $25, and a $60 fare could cost $150. The committee suggests regulations include that all transportation network companies disclose the cost of a trip on the app before the customer engages the service, and that the province monitors data to determine whether there should be a cap on surge pricing. On the other end, the committee recommends it also monitor trip data to determine whether a base fare should be implemented. The group also suggested that ride-hailing companies that do not offer accessible trips should be assessed a levy that could be used to enhance other accessible services. All transportation companies should be required to meet or exceed established mobile accessibilities standards, the report suggested, and drivers who have wheelchair-accessible vehicles should be provided a trip bonus. During the consultation process, some expressed concerns about employment structures. Security is another issue often brought up by critics. The committee recommended drivers be required to submit an abstract check, national criminal record and vulnerable sector check annually, all to be performed by a third party. Drivers should be required to meet Class 5 driver's licence requirements with additional provisions for medical exams, something the committee suggests being extended to taxi drivers as well. And apps should have built-in safety features including GPS tracking and full disclosure of driver and vehicle information, including licence plate number. Vehicles should also have an identifying decal to indicate they are associated with a ride-hailing company, and should be inspected on a standard schedule based on kilometres driven. A study released Wednesday by Ridesharing Now for BC, an advocacy group made up of members including the Vancouver Board of Trade and BC Chamber of Commerce, suggested 64 per cent of Metro Vancouver residents polled support ride-hailing services like Uber and Lyft. The group, sponsored by those companies, said 28 per cent accepted the idea, and nine per cent were opposed. Supporters were spread across demographics and political lines, Ridesharing Now said. Its poll was conducted online between Feb. 5 and 12 with 546 adults living in the Vancouver area. The margin of error for a comparable probability-based random sample is within 4.6 per cent, 19 times out of 20.